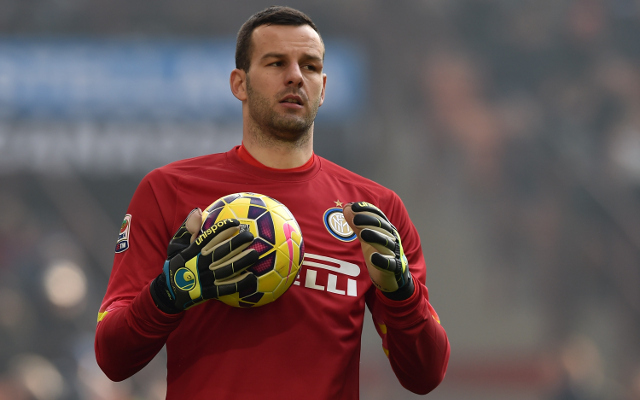 Sources in Italy reveal that Manchester United are closing in on signing Inter Milan’s Samir Handanovic as the successor to Real Madrid-bound David De Gea, but they face competition from AS Roma. La Gazzetta dello Sport reveal that Spain goalkeeper De Gea is closing in on a move to Real, and recent clues appear to suggest that the stopper will be a Merengues player next term. The international appeared to bid farewell to all four corners of Old Trafford ahead of the weekend’s draw with Arsenal, which quite understandably was interpreted as something of a ‘goodbye’ gesture. After the match, coach Louis van Gaal intimated that it would be difficult for De Gea to resist the proposition of a return to Spain, according to Sky Sports. “He is Spanish, he is Spanish international and now a Spanish club is coming,” the coach acknowledged after the draw. In light of the potential move, Gazzetta have suggested that Inter Milan keeper Samir Handanovic heads the list of possible successors for De Gea. The Red Devils already have 33-year-old Victor Valdes on their books, but with Handanovic looking to leave Inter in search of Champions League football, it may be the ideal time for United to make their move. However, according to FCInter1908, van Gaal’s side will face competition for the 30-year-old from Italian heavyweights AS Roma. The Giallorossi have not yet made an offer for the stopper, but the club’s director of football, Walter Sabatini, has indicated to Corriere dello Sport his desire to bid for the keeper at the end of the campaign. Roma, who currently sit second in the Serie A table, face third-place SS Lazio—their city rivals—on Monday as they look to secure a berth in the Champions League group stage for next season.